Prior to the introduction of the horse in America, Indians relied heavily on dogs, which was their only domesticated animal. They provided companionship, valuable body heat on a cold night, kept the camps free of small vermin and were highly valued as noisy sentries around the camps. The Indians had devised a two-poled platform called a “travois”, which, when strapped to the dogs chest and shoulders, enabled him to drag as much as one hundred pounds over rough terrain. This greatly aided the Indians when moving camp or hauling huge quantities of meat from great distances. Dogs significantly helped in tracking and chasing down large game animals, but if a dog was hard to train and barked or chased game at the wrong time, he could be killed and eaten. 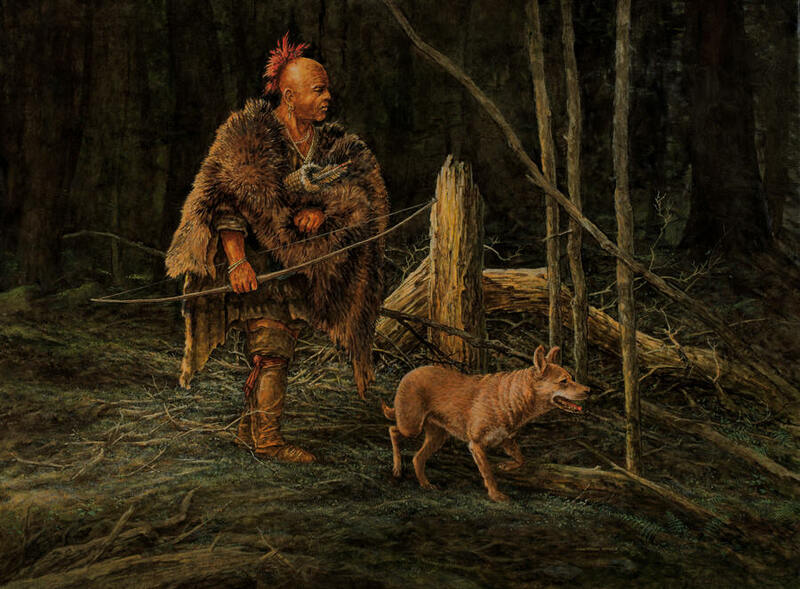 After white contact and hostilities arose between the white colonists and the natives, dogs were extensively used for man-hunting by both sides. This problem became so serious for the colonists that many communities and states passed laws that made selling or trading dogs to the Indians a serious crime. The aboriginal dogs had a basic appearance of a fox or small wolf. Numerous references from the 1500’s and early 1600’s describe the Indian dog as having sharp, long noses, pointed ears, a head like a fox with long sharp teeth. Colors mentioned were red, brown, white and black, and in 1534 Jacques Cartier stated that the Hurons from the St. Lawrence River area had dogs of black and white.